Combination Wilderness Safaris Vintage camp, Discoverer Camp, lodge overnight and serviced dome tent camping in private concession areas and campsites. This old-style serviced camping safari recreates a sense of adventure for the traveller seeking an authentic African experience. Adventurer Explorations camps consist of serviced spacious dome tents, designed to provide comfort in remote wilderness areas. The style of accommodation takes you back to the great days of African exploration. Pure cotton linen bedrolls (with duvets) on GI stretchers, bedside table with lantern and mini luggage benches complement the atmosphere in pristine, wild camping areas. Separate toilet and shower 'bathrooms' with old-style tin bucket showers and basins and amenities create simple serviced comfort. Adventurer camping brings the guest closer to nature, by means of lively campfires, hurricane lanterns, diverse activities and a warm atmosphere permeating the camp (and its simple comforts). Adventurer camps are specifically outfitted to create that wilderness camping feel with a clear emphasis on essential camp comforts and maximum wilderness experience. The entire safari is guided and hosted by a professional and passionate trained guide who shares in-depth knowledge to present a seamless, well-rounded experience. To ensure privacy and exclusivity, most areas in which we travel are private concessions in unspoiled and scenic prime locations. All campsites are for the use of Wilderness Safaris guests only, while at hotels and lodges we meet other guests. The route followed on this Exploration aims to track and reveal the elusive wildlife of the desert and the life-rich, the rugged Atlantic Coast and the immense moving dune fields of the Namib Desert. Surprisingly, the seemingly barren desert comes to life with an amazing plethora of plants and animals that have ingeniously adapted to their harsh surroundings - and in fact thrive. On this journey there is also an excellent opportunity to find even the largest of mammals surviving here - the desert-adapted black rhino and elephant. To maximise guests' travel time, a variety of transport modes that bring out the best of each area is used: flying in light aircraft transfers (when the travelling experience is not enhanced by road) and cross-country transfers provide both a bird's-eye view and an in-depth experience of the contrasting landscapes of Namibia. Please note that the driving leg from Palmwag to Hoanib Camp is a full day's nature transfer drive, highlighting fascinating areas of the Namibia's North West. Transfer by comfortable charter flight to Namibia's big game Country: Etosha and its environs. Here, the diverse flora and fauna is experienced in a variety of activities, from game walks to game drives and visits to hides both on the property and in the famous Etosha National Park. The Ongava Game Reserve is recognised as the nation's premier big game private game reserve. Combined with easy access to the extraordinary Etosha Park, Ongava Homestead provides the quintessential Namibian farmhouse experience. Ongava Homestead, situated in the private Ongava Game Reserve, is a renovated old farmhouse, with en-suite bathrooms and a farm kitchen overlooking a busy waterhole. Sleeping eight guests complete with domestic facilities, outdoor barbecue, bar, common dining, kitchen and bathroom facilities present a clean and comfortable base to experience and explore the fascinating countryside. Simple safari furnishings create a wonderful atmosphere in which to make friends and enjoy good company. The waterhole is floodlit at night to catch sight of nocturnal visitors, from the timid genet to big game such as white rhino and a host of antelope. Within Etosha on game drive we'll visit numerous springs and pans, in search of lion, leopard, elephant and black rhino, as well as plains game. After an early breakfast, we travel to the Palmwag concession. Here, on the concession and in the surrounding areas the desert-adapted elephant and elusive black rhino can be found. The camp consists of 5 Meru-style tents, built on individual, wooden platforms and offering a great scenic view of the surroundings and also the desert-adapted elephants when they visit the area. Situated about 600 metres away from the restaurant and secluded from the rest of Palmwag Lodge. The tents are tastefully furnished, with en-suite facilities, solar power and a wonderful atmosphere. Over the course of the next four nights in the enormous wilderness areas of Damaraland and Palmwag our guides expose the sheer magnificence of nature's survival strategies in this arid environment, through walks, tracking and game drives concentrating on a variety of topics from birds to insects, medicinal uses of plants and viewing wildlife. In addition, we travel through regions with an exciting array of exposed geological sequences, ranging in age from "young" 130 million-year-old igneous shale through to 850 million-year-old schist formations. With an early start, our journey continues by road towards the ephemeral river of the Hoanib Valley. Please note that this is a long nature transfer, giving guests a unique opportunity to see some of the most rugged and "hard to get to" areas within Namibia's remote North West. Here, in an area seemingly parched and desolate, we enter one of Namibia's richest desert wildlife areas. The rugged mountains and canyons of the Hoanib River provide a last refuge for some of the continent's most unique wildlife; this is the home of the legendary desert elephant and the last free-roaming black rhino population on Earth. In fact seventy-five per cent of Namibia's endemic species inhabit this last bastion of the wild. 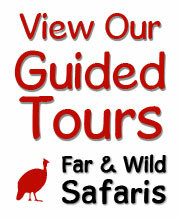 While here, we have the opportunity to explore this area on game drives and walks. Possibly, we can visit one of the nomadic Himba villages if they are in the region at the time. Experience the wilder side of Africa where only the sporadic roar of lion or cackle of hyaena punctuates the silence of the night. Our Discoverer-styled tented camp close to the Hoanib River is a relaxed haven from which we explore this wild land on foot, or from the comfort of one of our safari vehicles. The camp is powered by solar-powered inverter systems and there are no generators or pumps running whilst guests are in camp. There are 5 guest walk-in hexagonal Meru-style tents with en-suite and flush toilet and bucket shower bathrooms in a separate portion of the tent. Each tent is furnished with necessary comforts and styled with burnt orange interiors, wood and brass, effectively recreating a sense of the early explorers. Departing early, we travel east to Sesfontein and we end this road journey at the award-winning Damaraland Camp. Damaraland Camp is situated on the northern face of the Huab River valley and looking south toward the imposing Brandberg Mountain. The camp accommodates guests in 10 comfortable tented rooms (with en-suite facilities including flush toilets and showers) with endless vistas as views. The dining room and pub are combined under canvas, and an open fire is enjoyed on calm evenings. Early morning mists generated by the clash between the icy Atlantic Ocean and the warm desert air of the Skeleton Coast, drift inland along the river sand canyon, providing sustenance to the flora and fauna of the region. Although wildlife is not concentrated, we are situated where the rare desert-adapted elephant roams, alongside gemsbok (Oryx), springbok, Ostrich and other hardy desert animals. Rare succulent plants eke out an existence in this harsh countryside. After an early breakfast, we travel to Twyfelfontein where we take a guided walk with local Damara guides to view the San petroglyphs - prehistoric rock etchings, strewn over the rock face. After lunch we continue our journey travelling south via Uis en route to Swakopmund. As we get closer to the coast there are lichen fields strewn over the gravel plains, one of the most fragile ecosystems on Earth. After relaxing over our packed lunch en route, we make for The Stiltz Lodge in the quaint and charming town of Swakopmund, arriving in the late afternoon. Swakopmund, with its unique urban atmosphere that is a vibrant combination of Africa and Europe, is a wonderful town in which to end a safari after the experiences of the northern Namibian bush. The Stiltz, as its name implies, is built on stilts, providing breathtaking views of the Atlantic Ocean, the red iron-rich beach dunes and also the Swakopmund River mouth. Each of the 8 minimalist yet elegantly furnished thatched bungalows is linked by wooden walkways to the main restaurant. As the lodge is sited close to the central part of town, this allows for easy access to enjoy the special hospitality, history and cuisine. After an early breakfast, we drive southwards to Walvis Bay Lagoon. Here in a protected bay, many flamingos, pelicans and other waterfowl amass. On the calm waters of the bay, we experience sea kayaking, a spectacular activity that allows us to approach seals, dolphins and water birds at a respectable distance and in their habitat, allowing for some unique photographic opportunities. Afterwards, we drive inland to the Kulala Adventurer Camp in our private Sossusvlei concession. Here we enjoy access to the Sossusvlei dunes, for walks in the immense moving sands of the Namib, game drives on our concession and stargazing. Photography in the early morning of the dunes is particularly stunning with rich reds and dark shadows completing the extraordinary vista that is the enormity of the Namib Desert. After breakfast we transfer by road, including lunch overlooking the view of the plains nearby, to Windhoek and bid farewell to the adventure. International air connection onto the safari: If arrival is planned for the day of the safari's departure, please ensure that this is with the earliest possible international flight arrival, before 10h00. Arrival on a later flight may necessitate additional road or air transfers (as departure for the first camp/lodge will already have taken place), subject to extra cost. International air connections leaving the safari: Please ensure that your departure flight is booked for after 15h30 from Windhoek. For earlier international departure flights, an additional transfer will be required to arrive for this connection. Extra transfers and flights are subject to extra cost. Bilingual safari dates: This service aims to facilitate a greater level of experience for guests that do not speak English fluently. These safaris will be led by a guide; however there may be a translator to assist the guide. Please note on all bilingual safari dates that the guide or translator's home language is English / Afrikaans. This additional free service does not guarantee the level of fluency and depending on group dynamics a varying amount of the foreign language will be spoken. Flashlights/ torches: Please ensure that a minimum 2-D cell flashlight is brought on safari, with spare batteries. Head lamps are also useful. Wilderness Safaris does not supply flashlights. Camera battery charging facilities: Please note that a 12V cigarette lighter adaptor will be required (that is compatible with camera make) on this safari for charging batteries while on game or transfer drives. 110/ 240V outlets are available at Ongava Homestead, Damaraland Camp and The Stiltz Lodge; however Hoanib and Kulala Adventurer Camp only have 12V electricity. Dietary requirements and special occasions: Due to remote locality of Explorations camps, please ensure that full dietary requirements and special occasions are advised at the time of your booking confirmation.